This Christmas Spiral Tree is the ideal solution for those living in small apartments who do not have enough space to have a traditional Christmas tree. Dala Glass Glaze is a water-based paint available in 15 colours. It produces a beautiful, high-gloss, durable glass-like finish with no brush marks, which makes it particularly popular with glass and paper maché artists. It is also used as a decorative ceramic colour. It is adhesion promoting and will adhere to most surfaces – even on the more difficult ones such as tin and wax. Dala Paint Appeal is a peelable, water-based, non-toxic formula, ideal for children and crafters. Apply the paint directly onto a non-porous surface from its applicator, allow it to dry and peel it off. This medium is perfect for creating removable window decorations. Place the acetate over the spiral design and use the felt-tip pen to trace the spiral design onto the back of the acetate. Using the masking tape, tape a frame around the spiral design traced onto the acetate. This will keep the Glass Glaze from flowing from the acetate. Using the soft, flat brush, colour the acetate with a thin, even, layer of Dala Glass Glaze. For a marble effect, drip a few drops of a darker colour Glass Glaze and lightly stir with a brush. Allow to dry for 24 hours. Using the scissors, cut the design out on spiral traced lines. Carefully make a hole in the middle of the inside edge of the spiral. Loop the gut or string through, tie the end to the round ring and hang from the ceiling with the screw-in hook. To make the stars, place the second piece of acetate or glass over the star design and trace the star with the Paint Appeal. Allow to dry for 24 hours. Tip: For an effective, evenly-lined design, ensure that the Paint Appeal bottle is held at a 45° angle, so that the hole of the nozzle is always visible, thereby creating a raised and not a flat line. 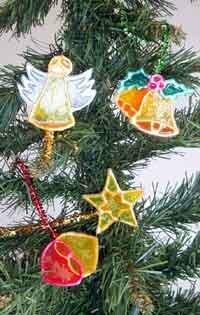 The stars can then be taken from the piece of acetate or glass and placed onto the spiral Christmas tree as decorations. This item has 620 views.